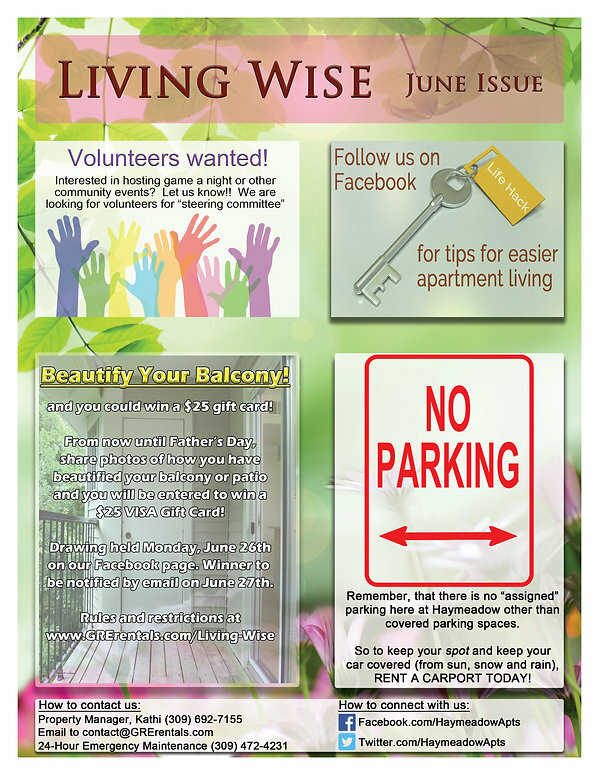 In this month&apos;s issue of Living Wise, we are calling out to YOU, Haymeadow Residents! We want volunteers to help us with Community Events. Are you a wiz at organizing RUMMAGE SALES? Do you have an interest in a community TRIVIA NIGHT? Let us know! We are looking for ideas AND for people to help steer those ideas! Email or call if you&apos;d like to volunteer!Also this month, we reminder residents that there is no "assigned parking" unless you rent a carport, and are announcing "Haymeadow Hacks", tips for easier apartment living, appearing on Facebook regularly. Don&apos;t forget to BEAUTIFY YOUR BALCONY by adding some color (maybe a potted plant or two) or just by cleaning up the clutter! Submit a picture of your patio/balcony, along with your name and apartment number, via email to contact@GRErentals.com (SUBJECT LINE: Beautify Your Balcony). On June 26th, we will draw one name and announce that winner on Facebook.com/HaymeadowApts. It&apos;s that simple! Send us a photo and you will be entered in a drawing to win $25!That&apos;s it for now. Thank you for reading and sharing. As always, we welcome your input and look forward to seeing you next month!